This winter help out your feathered friends with this cool new Heated Bird Bath. Birds need access to water year round, not only for drinking, but for grooming their feathers to help keep them properly insulated against the cold. 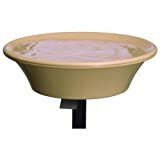 This innovative heated bird bath easily mounts to a deck railing or in the yard with the included pole and has a completely hidden 70 W heating element beneath the surface to keep the water ice free all winter long. It features a built-in automatic thermostat, tilts and lifts for cleaning or storing and has a power cord that clips underneath when heat is not required during the rest of the year. 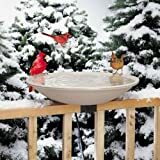 This bird hot tub is sure to be the number one spot for birds to hang out and socialize at every winter and it makes the perfect gift for bird lovers.